The wreckage of the Silver Bridge across the Ohio River. The bridge collapsed in 1967, with the loss of 46 lives. The view is of the Ohio side, where the collapse began with the failure of an eyebar in the chain link suspension structure. The eyebar failed due to a phenomenon known as stress corrosion cracking, which occurs when a metal or plastic member under stress is also exposed to chemically corrosive materials. When the bridge was designed, a typical automobile weighed about 1,500 lb (about 680 kg), and the maximum permitted truck gross weight was about 20,000 lb (about 9,000 kg). Traffic jams were rare. By 1967, a typical automobile weighed about 4,000 lb (about 1,800 kg), and the maximum truck limit was 60,000 lb (about 27,000 kg). Traffic jams were occurring several times a day on weekdays. In short, the bridge was exposed to much higher stress in 1967 than existed at design time, which eroded its safety margin. The corrosive material was water from precipitation and atmospheric condensation, no doubt mixed with unexpectedly high levels atmospheric pollutants and possibly bird droppings. This tragedy occurred for two sets of reasons. First, the bridge element that failed was exposed to environmental factors and chronic loads that pared safety margins and elevated the probability of failure. 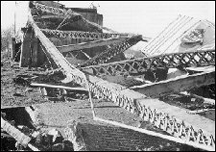 Second, the design of the bridge was such that a single element failure could lead to total catastrophic collapse. Organizations today are slowly (or not so slowly) migrating toward analogous configurations. The load on people throughout the enterprise is rising, and the combination of overwork, fear of joblessness, and fear of financial ruin is providing the corrosive stew that can lead to unexpected organizational and personal collapse. View a short documentary explaining the Silver Bridge collapse. Read a short summary of the factors contributing to the collapse. Photo courtesy Federal Highway Administration, United States Department of Transportation. Some vocations are known for chronically pushing people beyond overwork: entrepreneurs, doctors, attorneys, and air traffic controllers come to mind, among many more. But hyper-super-overwork is now much more widespread, as companies increase workloads to compensate for dramatic staff reductions. Overload is dangerous. To address it, you must first recognize it, and then act to control it. Here are some indicators that you might be severely overworked. Sleeplessness can result from chronic overwork. You need time to wind down before sleep. Inadequate exercise, increased use of stimulants (coffee or tea), and more frequent take-out meals can lead to sudden weight gain. Canceling or repeatedly delaying medical and dental care is risky and expensive. Neglecting or denying your own need for support and emotional connection is serious, but neglecting or denying the needs of others can permanently damage relationships with your spouse, children, relatives, friends, and colleagues. Neglecting home or vehicle care can create financial and safety risks. Neglecting hygiene and wardrobe can seem safe enough at first, but they can be demoralizing. And here are some tips for the hyper-super-overworked. If your best friends at work have left or have been laid off, you might feel loss and loneliness. Are you coping by taking on work? Deal with difficult emotions directly. Find someone to talk to: spouse, friend, cleric, counselor, or psychotherapist. There are two popular strategies. You can focus on work, dealing with problems at home only when they become really severe, or you can ask for help and understanding at home as soon as possible, and find ways to be together lovingly and with respect. The former is tempting because it's easier at first, but the latter is definitely the way to go. Perhaps the definition of "doing things right" needs review in light of current conditions. Is it really necessary to do all you're doing? More on perfectionism. loss and lonelinessco-workers cope with overwork by asking for favors or help. Refusing management requests can be risky, especially if you need the job, but help requests from peers or subordinates are different. Delay responding. When you do respond, make a counter offer — selective assistance or looser deadlines. If you work with computers, almost certainly you aren't using some of their most powerful features. Be selective. Learn to use capabilities that save time by automating tasks you now do yourself. Would you like to see your comments posted here? rbrenmBNxVstaSIGWEjiUner@ChacJUWokoXtqjotMsHaoCanyon.comSend me your comments by email, or by Web form. I offer email and telephone coaching at both corporate and individual rates. Contact Rick for details at rbrenCKGpzEihSmUTVHqMner@ChacusFiFIDdLcslBZcloCanyon.com or (650) 787-6475, or toll-free in the continental US at (866) 378-5470.